If the task of unifying your data ever crops up in your sheet, get this add-on to handle it easily. 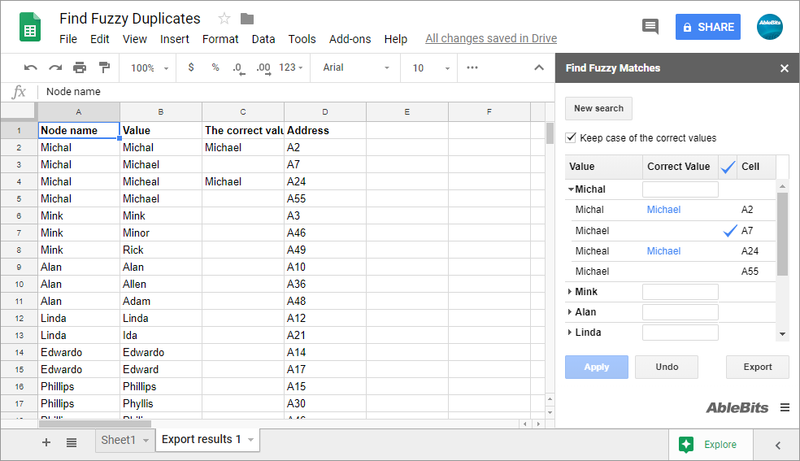 The tool compares all words from the sheet for similarities and differences and prepares a list of all fuzzy duplicates grouped by record for you. Mark a correct word and change all similar misspelled words in a click or export search results to a new sheet. Scan the selected range for typing mistakes Find fuzzy duplicates that differ in 1 to 50 characters. Correct all fuzzy matches at once Pick the correct value or enter a new one to apply changes to all similar records. Navigate between the sets of misprints quickly Get all typos conveniently grouped by record. Export search results Get a better view of all found mistakes and the corresponding proper values on a new sheet. What is Find Fuzzy Matches and what do I need it for? 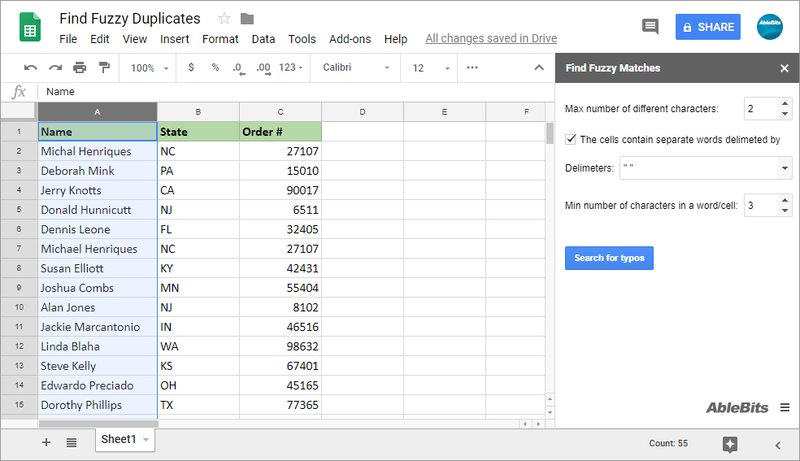 This tool is designed as a quick spell checker for Google Sheets. It will help you make sure all records in your table are spelt correctly. Instead of thoroughly looking at every word, have the add-on search for all typos for you. You can remove any irrelevant values from the list of found records and deal with the rest in a couple of clicks. Doesn't Google offer similar feature? 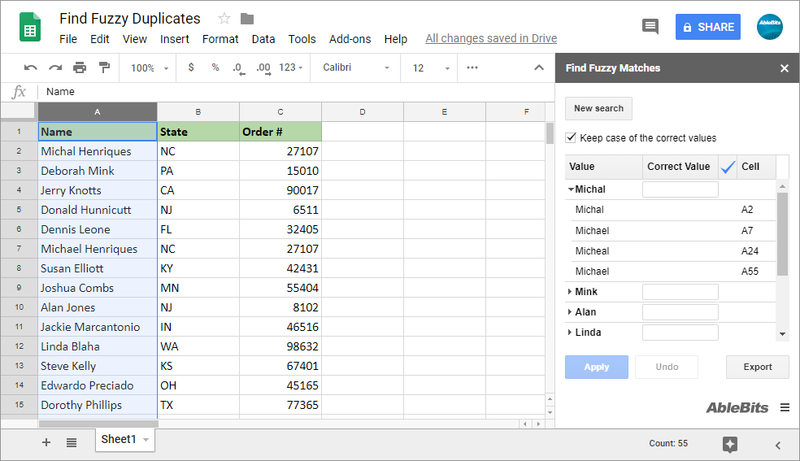 If you know how to handle Google Apps Script, you can make it look for fuzzy matches for you. Otherwise, our add-on can become your best assistant for the task. How can I find fuzzy matches with your add-on? Specify how many chars may differ in your words. Identify the minimum number of total chars in a word/cell. 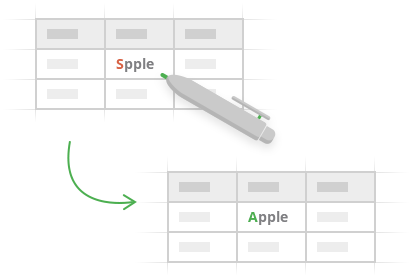 If cells contain separate words, turn the corresponding setting on and specify the delimiter. How do I work with the found typos? To correct the mistakes, review the list of all misprints, pick and click the proper value, and press Apply. To export the misspellings, click Export right away. What if all found words are misspelled? Can I change them all to something else? Yes. Once the add-on returns the results, look through the records. If the table doesn't happen to have the right word, enter your own value next to the needed group of typos. Will the add-on work if there is more than one word in some cells? Yes. Tick off a special option and enter all delimiters that may separate your words, and you're good to go.